Production downtime and scheduled outages are few and far between in the mining industry, making it difficult to perform an upgrade, redesign or maintenance work. Portable offline filtration systems work much like an offline dialysis unit on a patient with kidney failure, providing a simple solution until a permanent fix can be found. 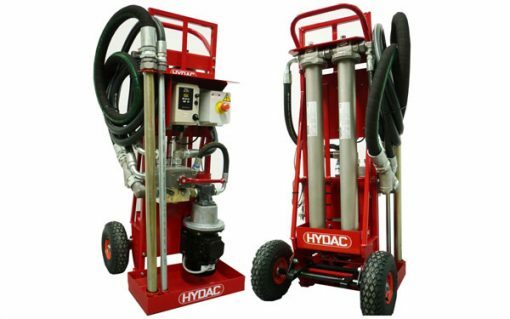 Melbourne-based Hydac launched its new offline portable filtration system at AIMEX this year and believes the product addresses previous transportability problems as well as a number of other concerns flagged by the market. The hydraulic equipment manufacturer’s Offline Filtration Trolley OFT3 is mounted with a tilt axle arrangement that requires less than half the effort to tilt back and move around compared with conventional filter trolleys, meaning it can be handled by one person. According to Le Roux, the unit is small enough to fit through most walkways and large pneumatic tyres make the unit suitable for stairs. “Another consideration is the type of oils to be filtered, since, in most plants, there will be a few makes and types of oils that need filtering,” Le Roux said. Le Roux said that the viscosity of the oil played a major role in determining filter size, with thicker oil requiring a larger element. He added: “Hydac Flexmicron elements give versatility in the selection of element micron sizes, from one micron to 90 microns, across a wide range of applications. “The unit is fitted with a variable-speed drive, which allows various flow rates to be set for the pump. The trolley is also fitted with a dual function hand-control valve that allows the user to either transfer the oil while bypassing the filter assembly or switch to continuous offline filtration. This eliminates the need to use drain plugs when changing the oil.